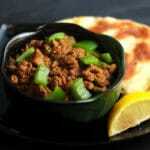 Okay, let’s get back to the basics today – Spicy Minced Beef with Capsicum aka Shimla Mirch Keema. The last post I did was all about over the top chocolateness, a kind of indulgence that is perfect for celebrations and sharing. Right, let’s get back to business. Today’s recipe is all about going back to the roots. 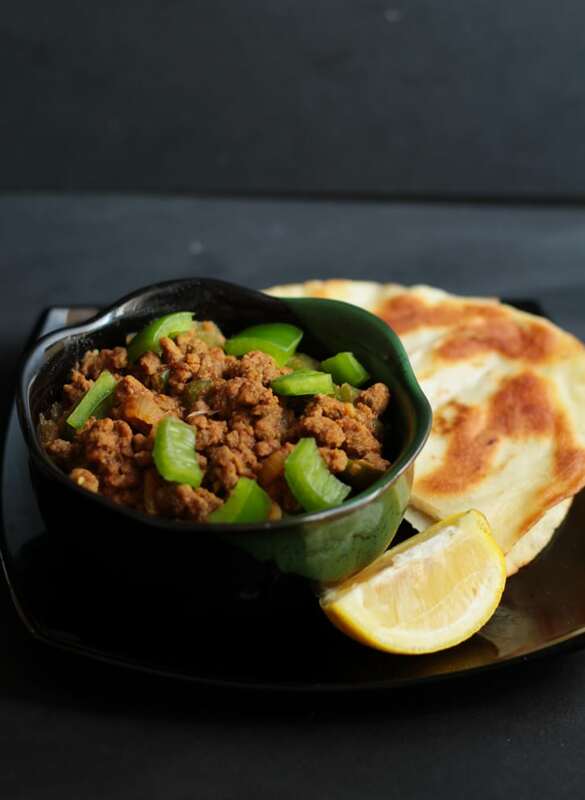 It’s about finding comfort on a busy weeknight with a bowl of this simple bowl of minced beef and capsicum (bell pepper) to be scooped up with soft pita bread. You can also pair this spicy minced beef with capsicum with white rice, it would be equally good! This is one of the quickest and simplest dishes I make in my kitchen. While I love spending time in the kitchen, trying out new recipes, sometimes I just want something that’s fast, easy and obviously delicious. We don’t make non-delicious things in my kitchen. Nope, never, ever. This Spicy Minced Beef with Capsicum is a super easy recipe to make and requires only a few basic ingredients which are easily available. 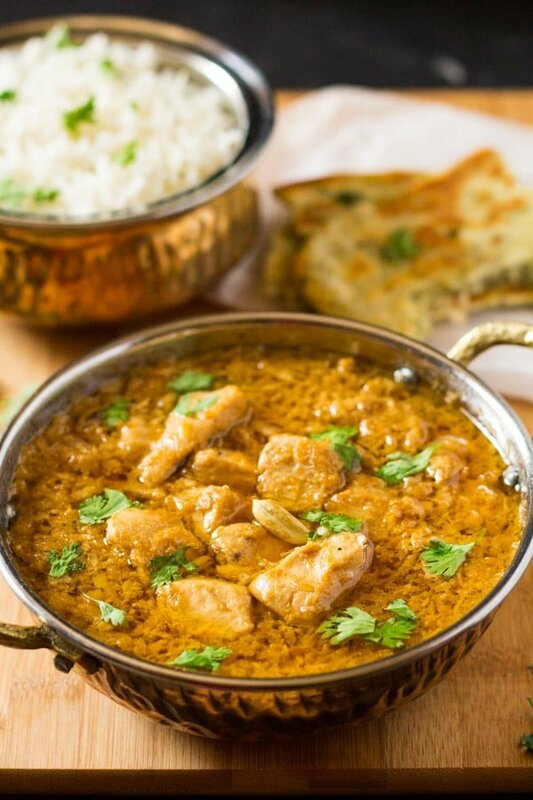 When it comes to Indian food a lot of people are hesitant to make it at home because it requires a lot of complicated steps and recipes. But this Spicy Minced Beef with Capsicum is so easy peasy! This is a 10 ingredient kind of a recipe and also uses only one pot. We all love one pot recipes don’t we? Those are the best, because seriously who likes doing dishes? By the way, am I the only one who likes to wash dishes before dinner is ready so that I can eat in peace without worrying about a million dishes lying in the sink? Obviously you can’t wash the dishes before dinner for this recipe because it only requires one pot, so that’s kind of brilliant right? 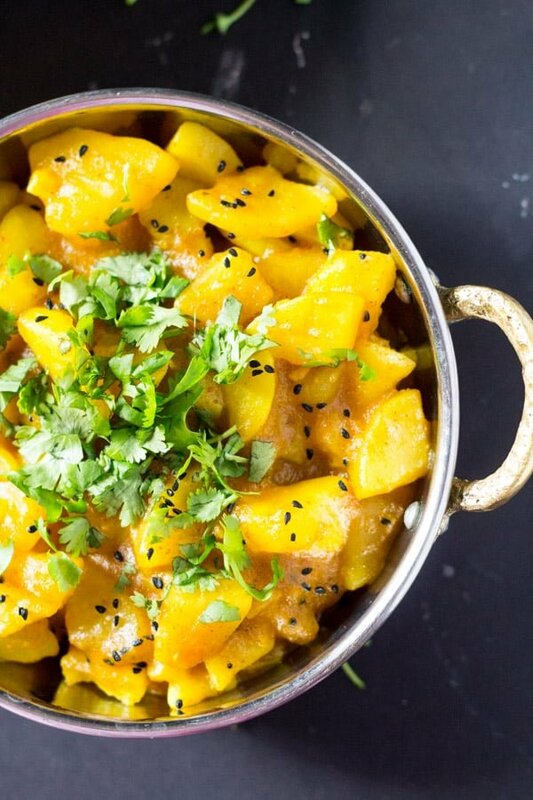 Looking for more easy Indian recipes? 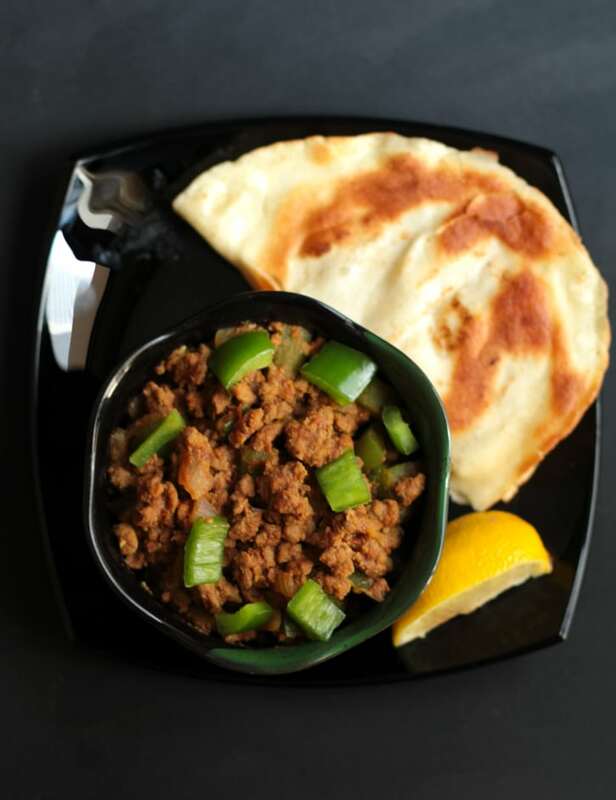 A quick and easy delicious recipe of minced beef with capsicum that pairs perfectly with flat bread or white rice. Only 10 ingredients needed to make this bowl of comforting goodness. In a large pot heat the oil and add the chopped onions. Saute the onions till pale and translucent (do not let them brown). Add in the minced beef and saute for 1-2 minutes and then add the ginger garlic paste, and saute for another 2 minutes. Add the spices (salt, red chili powder & turmeric) and the tomatoes. Cover the pot with a lid, and cook on medium low high heat for about 15 minutes, or until the tomatoes are softened and cooked through. Uncover the pot and on high heat and cook the minced beef until the excess water has dried and the oil has separated. Add the chopped capsicum and cook until it is slightly softened. Serve with pita, flat bread or white rice. #4 in the Instructions say to “cook on medium low high heat”, which is a contradiction. What heat setting had you intended to suggest? Thanks. It’s medium low heat. You need that for the tomatoes to release water, in which the meat will cook.